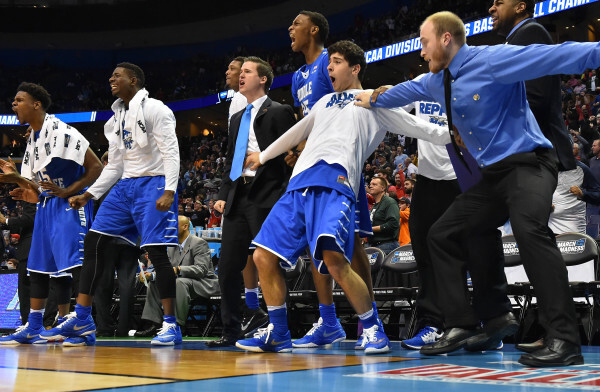 Middle Tennessee Blue Raiders bench reacts during the second half in the first round against the Michigan State Spartans against the Michigan State Spartans in the 2016 NCAA Tournament at the Scottrade Center in St. Louis. Middle Tennessee State won 90-81. ST. LOUIS — They blew up social media and busted brackets over two hours on Friday. And then Middle Tennessee acted like pulling off one of the biggest upsets in NCAA Tournament history was no big deal. But the Blue Raiders were a big deal, leading wire-to-wire and stunning Michigan State 90-81 in the first round of the NCAA Tournament’s Midwest Region at Scottrade Center. MTSU (25-9) becomes the eighth No. 15 seed to upset a No. 2 seed in tournament history, and this is the highest-seeded Michigan State team to lose in the first round. That honor previously belonged to Jud Heathcote’s final team in 1995, a No. 3 seed that lost to No. 14 seed Weber State. And in an interesting twist, the Blue Raiders’ win for the ages may serve to benefit the Orange, who will face them in the second round on Sunday. Instead of facing a team many felt would win the national championship, Syracuse instead gets to wear the white uniforms in a classic bracket collapse matchup. However, Middle Tennessee could present the Orange with the same problems it gave the Spartans (29-6) all day. Its undersized lineup essentially forced Michigan State coach Tom Izzo out of his big lineup and left them a man short one way or the other. The seeds were 15-2 and so was the score at the first TV timeout, Middle Tennessee scoring the first six times it possessed the ball and setting a tone the Spartans would never overcome, try as they might. The Blue Raiders’ players said it gave them a hit of confidence that helped them through 40 minutes. Davis took a calculated risk, having his team play a switching man-to-man defense that emphasized defending the perimeter while taking their chances with Michigan State’s post game. While forward Matt Costello took advantage of smaller defenders to score 22 points on 9-of-10 shooting, Middle Tennessee’s strategy kept guards Denzel Valentine and Bryn Forbes in check. A National Player of the Year favorite, Valentine made just 5 of 13 shots, finishing with 13 points, 12 assists and six of the Spartans’ 14 turnovers. Forbes hit only 4 of 12 attempts, ending the day with 14 points. Leading 41-35 at halftime, the Blue Raiders absorbed every haymaker Michigan State landed in a second half in which it hit 15 of its first 22 shots, drawing within 65-64 on Costello’s short jumper at the 8:04 mark. But forward Darnell Harris whipped Costello off the dribble for a 3-point play, then drilled a 3-pointer on Middle Tennessee’s next possession. Later, guards Jaqawn Raymond and Perrin Buford took turns driving for layups to keep the Spartans at bay. Finally, guard Giddy Potts’ pull-up jumper with 59 seconds remaining supplied the Blue Raiders with an 81-76 lead. Potts and Buford combined to sink 7-of-8 free throws in the final 30 seconds to wrap up the win. When the final horn sounded, Buford spiked the ball into the floor and joined his teammates for the postgame handshakes, largely devoid of the wild celebration that generally accompanies 15-2 upsets. Potts finished with 19 points, while Buford stuffed the stat sheet with 15 points, seven rebounds and six assists. Harris added 15 points and Raymond scored 11. His voice cracking frequently, Izzo called the result the toughest loss of his career. Prior to Friday, the signature win in Blue Raiders’ history was a 50-44 dumping of Kentucky in the 1982 NCAA Tournament, spoiling a Kentucky-Louisville matchup in the next round. Davis took a stab at putting this one in perspective.